Kenny Williams just spoke with the media and he said he was surprised that Mike Trout extended with the Angels. He thought the White Sox had the best offer on the table for Trout. why is the sox fan in the 2nd row sleeping? thats how I saw it. And for the record he did not throw Yonder and Jay under the bus. he simply stated that they liked the decision. lets not blame Manny. This is on the sox and this stain will not wash away. forget your Harper, Arrenado, Trout, Gerrit Cole dreams. 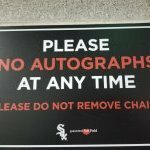 the sox blew there opportunity to fix the orginization process.